The shortage of workers in the region, has left leaving medium and larger garment manufacturers dependent on migrant labourers. 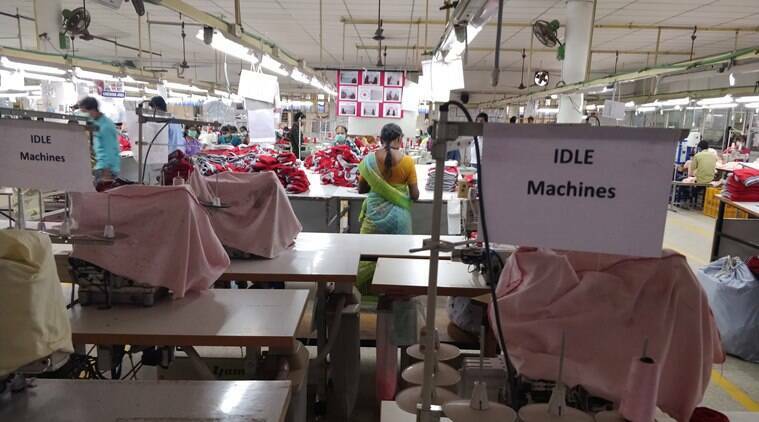 Inside a gated complex in Tirupur, knitwear manufacturer and exporter CBC Fashions (Asia)’s one-storey unit is seemingly teeming with employees. Yet, amidst the whirr of sewing machines and the flurry on the expansive shop floor, it is almost easy to miss the lines of unmanned ‘Brother’ machines. “A few of these machines are only required for specific kinds of stitching, but the rest are idle because we don’t have tailors to work them,” says the unit’s manager, G Manickam. In another part of the city, a similar scene is on display at an eight-person garment stitching work unit, Kavya Garments. A few ‘Juki’ machines are stacked against a wall of the one-room unit as if discarded. They are not covered or labelled but the thin layer of dust shows how long they, too, have been idle. Tirupur, known as one of India’s major textile hubs and touted to be the ‘knitwear capital’ of the country, has a growing labour problem. Yet, there is a disagreement over whether this problem is one of a shortage of workers or a shortage of jobs. As Tirupur gears up to vote Thursday, underemployment and rising living costs, coupled with the continuing impact of policy measures such as the Goods and Services Tax, especially on small-scale manufacturers, is difficult to miss across the city. Kavya Garments owner Dhandapani, who says he had to lay off nearly half his tailors due to dropping demand from his clients, says there isn’t enough work in the city’s once vibrant textile industry. A few tailors knock on his doors almost every day looking for work, and the sight is becoming common at job work units like his-a sign that things are getting worse for the city’s blue-collar workforce, according to Dhandapani. “If you want to find out how many people are currently looking for jobs in this industry, all you have to do is put up a vacancy sign with your phone number and you’ll get at least 100 calls by the end of the day,” he says. And there are two sides to this problem. While some larger garment units, especially those producing for export, say there haven’t been enough workers for jobs like stitching, cutting, checking quality and ironing, several workers claim that there isn’t as much work to do now. There is a growing shortage of skilled workers in the region, leaving several medium and larger garment manufacturers dependent on people migrating from other states in search of better opportunities, argues CBC’s managing director, TR Vijaya Kumar. “Every” export house in Tirupur is facing around 30% shortfall in labour, up from 20% two years ago, he claims. “We have an overcapacity of investment and we are depending entirely on migrant labour. Nowadays, in every state, industrialisation is happening, so the migrancy coming in is reduced,” says Kumar, who is also the general secretary of the Tirupur Exporter’s Association. This shortage is among the reasons that several garment companies in the region have shifted their units from Tirupur to other cities, states and even countries, according to him. Several members of Tirupur’s blue-collar workforce, especially those in job work units, disagree. As several job-work units continue to reel in the aftermath of policy interventions by the centre, fluctuating raw material prices and increasing competition from migrant labourers, finding stable work has become difficult for them, they argue. The local workforce claims they lose out in jobs to migrant workers who agree to work for less money. “They charge less than we do, so our company asks us to work at their rates. We can’t compete with those wages, because our cost of living is so high,” says 40-year-old Brinda, who works for a garment factory in the city. According to her and her co-workers, most families end up having to take private loans with high interest rates to get their families through the week, because their wages have not increased enough to offset rising rent costs. A labour contractor for several companies claims the shortage is also a result of companies not willing to increase salaries commensurate with worker’s demands after the implementation of GST in 2017. “Before GST, the companies would pay them a good salary-around Rs 300 per shift. Tailors would get around Rs 350 per shift. But now, with companies facing GST and other problems due to bank procedures, they are not able to give this kind of salary anymore,” the person says. Around 25,000 small-scale companies have been affected, while bigger companies are “wealthier” and more established, so they are able to manage even without as much labour, the person adds. The managing director of another export house says the shortage became more prominent after demonetisation, which forced several workers to leave the city and go back home. After GST was implemented, a drawback scheme that such companies used to enjoy was eliminated, employing more people has become difficult as bottom lines have also been affected, said the MD. With India facing competition from countries like Bangladesh, Vietnam, Pakistan and Sri Lanka, which have incentives like duty-free access to markets like Europe, textile exports from Tirupur also dropped around 10% in 2017-18, according to CBC’s Kumar. Even with some companies trying to make up this loss by increasing their access to the domestic market, their profit margins would have been impacted, which could be a factor in slower hiring, according to DK Pant, Chief Economist, India Ratings. “If companies are diversifying from export to domestic, and if the profit margins in domestic are lower, then there is all the more pressure on reducing cost, which means you will continue to see pressure on labour wage and demand,” he told The Indian Express. Apart from this, factors like Tirupur’s own economic development over the last decade would also have an impact on labour demand for higher wages, because of increase in rental, food and transport costs, he said. Depending on how specialised the skills involved are, another issue that the labour market in Tirupur would be facing would be the quality of the workforce available, according to him. “If better quality of labour is not available, you may have this dichotomy where manufacturers may say that labour is not available, because they are looking at a particular skill-set, while labour will say that jobs are not available and whatever is available is at a lower cost,” he said.